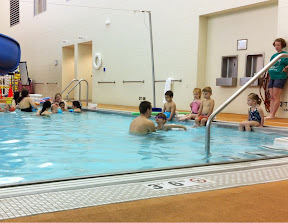 Today Alyce started her second session of swimming lessons. She didn't meet the criteria to advance to the next level so she is retaking this level. This didn't come as much of a surprise to Mom or I and Alyce doesn't seem to mind retaking the class. This year things are a bit different. For starters her teacher is a guy instead of the nice girl that taught last session. We are hoping that she was on vacation or something and will be back next week. We are wanting a girl because we think Alyce would open up better to a women over a man and that would give her the confidence to try new things. The next difference with this session is that there are two other girls in the class and only two boys. This fact wasn't lost on Alyce as she informed me of their presence after class. As expected the two girls didn't splash and Alyce didn't have to protect herself from all those splashing boys. Alyce was much more relaxed this time around. She didn't cling to the wall and tried some of the things the teacher was teaching. 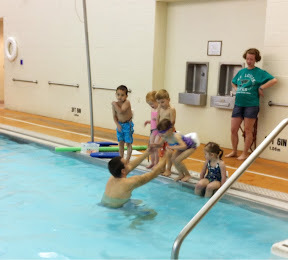 For instance while swimming with assistance Alyce used her arms to help her move including taking them our of the water to do so.